To recognize governments who meet the criterion developed by PTI that represent a “culture” of excellence through technology governance and practices across the enterprise. To highlight enterprise–wide technology policy and program achievements of PTI member jurisdictions to others, including associated professionals and other associations. 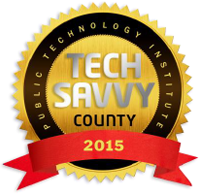 What Does it Mean to be Tech Savvy? Esri presented Pinellas County, Florida, with the 2016 Enterprise GIS Award for innovating a smart community governance model. That model fulfilled county initiatives to build a public GIS with apps that benefit the community. One of those apps used Federal Emergency Management Agency (FEMA) open data to save property owners $5.3 million on National Flood Insurance Program (NFIP) premiums. The Pinellas Business Technology Services Board established a group to prioritize and create web GIS apps. Acting as a steering committee, the group decides which apps will be built by the county's GIS team according to level of need. In 2015, one of the high-level needs was keeping NFIP discounts in place for county property owners within flood zones. "We created [the] Flood Map Service Center to serve FEMA flood zone data and show which parcels intersected with the zones," said Martin Rose, CIO, Pinellas County. "Pinellas has more properties in the NFIP than any other county in the US, so its real estate market would be significantly affected if those subsidies went away." Working with the board, the GIS group produced a total of 16 task-driven apps, which make up its public GIS gallery. Tasks green-lighted by the board include apps for monitoring local crime activity, obtaining zoning information, and researching tax parcel and property valuation information. The board also guided the creation of an open data portal, a self-service hub that allows anyone to map open datasets in the same manner as using the Flood Map Service Center. "Pinellas County distinguished itself as a smart user by writing GIS directly into its governance structure," said Jack Dangermond. "That high-level support and collaboration results in apps that do great things for the community." Pinellas County was selected as one of 3 jurisdictions in the United States awarded with the Tech Savvy designation. 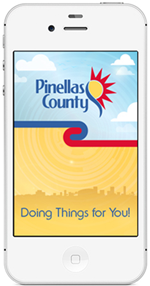 Pinellas County’s “Doing Things for You” mobile app gained top honors for innovation this year from one of the nation’s leading nonprofits in local government technology. A panel of judges for the Public Technology Institute recognized the new platform with the organization’s 2015 PTI Solutions Award. The app allows citizens to report issues in the community on their mobile device with the swipe of a finger, a simple solution that helps the county quickly receive and respond to service requests. The platform allows the county, municipalities and the Florida Department of Transportation to identify and address everything from potholes to flooding. The technology makes it easier for citizens and their government to work together at making the community a better place, according to Michael Roiland, web manager for the county’s Business Technology Services department. “Through citizen participation and government partnerships, we’re collaboratively improving communities while setting a new standard for public service,” Roiland said. The annual PTI Solutions Award is open to members of the Public Technology Institute, a Virginia-based nonprofit that promotes technology in local governments. Awards were presented to this year’s winners at the PTI 2015 Local Government CIO Summit, Oct. 11 to 13, in Salt Lake City, Utah. Pinellas County has been designated as a 2015-17 Citizen-Engaged Community by the Public Technology Institute (PTI). This award reflects accomplishments in the application of technology, strategic processes, multi-channel communications and performance management excel in extending citizen participation and responsive government. Pinellas County’s website is staying in the spotlight by continuing to shed light on county government. 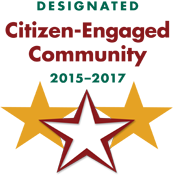 The national Sunshine Review awarded its annual Sunny Award to Pinellas County government for its website and, for the fourth consecutive year, it scored an A+ for transparency. The county website is www.pinellascounty.org. Sunny Award winners are chosen by Sunshine Review, a national non-profit organization that evaluates state and local government websites nationwide for transparency, citizen engagement and accountability. This year, 247 of the more than 1,000 government websites ranked by the Sunshine Review earned a Sunny Award. The Sunshine Review gives an A+ grade to government websites that meet the stringent transparency checklist measuring what content is available online against what content should be provided. 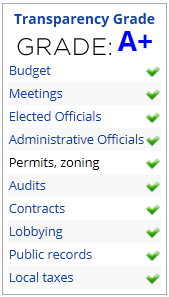 The checklist includes 10 specific transparency criteria: budget, meetings, elected officials, administrative officials, permits and zoning, audits, contracts, lobbying, public records and local taxes. Developing a mobile site, establishing LiveChat, adding the mobile app and eTownHall/iTownHall interactive events are among the initiatives launched by the web team. Online bill payment, park shelter reservations and mobile Know Your Zone evacuation zone lookup exemplify the many features that are continuously being integrated in the county website. Citizens can easily find information on board vacancies, contact their elected officials and request public records through Internet access to their county government. Pinellas County’s website has also received Best of the Web and Digital Government Achievement awards from eRepublic’s Center for Digital Government and is recognized as Web 2.0 Enabled by the Public Technology Institute. For more information, visit PinellasCounty’s report card. Pinellas County government earned the 2014 Best of the Web finalist designation, marking the fifth consecutive year that Pinellas County has been rated in the top 10 nationally for Best of the Web and Digital Government Achievement Awards, in the County Portal category. The announcement was made October 7, 2014 in Sacramento California by e.Republic’s Center for Digital Government. The Best of the Web award recognizes outstanding government portals and Websites based on their innovations, functionality and efficiencies. Pinellas County launched an ambitious redesign of its Website, focusing on providing on-line services and making the site more easily navigable. An ongoing project, the site’s functional capabilities have been enhanced and on-line services that include payment for services and public record searches have increased the value of the site to citizens who use the Web for a variety of services such as paying bills, making park shelter reservations and applying for social services. On May 21, 2014 the Public Technology Institute in Alexandria Virginia announced that an independent panel of judges identified the recipients of PTI’s 2013–2014 Technology Solutions Awards. This is a national-level awards program recognizing significant innovative and cost-saving government technology solutions. Note-On June 12, 2014 the Pinellas County Spending in the Sunshine - Government Transparency Dashboard also received a 2014 NACo Achievement Award submitted by the Clerk of the Circuit Court & Comptroller. On May 9, 2014 Pinellas County was selected to receive a Special Achievement in GIS (SAG) award at the 2014 Esri International User Conference. This award is given to user sites around the world to recognize outstanding work with GIS technology. Every year, ESRI solicits nominations of outstanding GIS programs internationally for recognition at the ESRI Conference in San Diego. Nominations are carefully evaluated and ESRI only selects 175 of its more than 100,000 customers each year for the SAG Award program. The eGIS Team accepted this award on behalf of Pinellas County at the 2014 ESRI Conference on July 16th. More information on the award. On May 25, 2011 the Pinellas County web portal was one of four Counties in the United States to win the Public Technology 2011 Web 2.0 State and Local Government Award for Harnessing the Power of Civic Media. The winners represent diverse communities and a range of Web 2.0 applications, including excellent uses, cross-coordination and functionality for Facebook, Twitter, eTown Halls, Mashups and Mapping, Citizen Service Request Portals, Mobile Applications, Live Web Chats, Multi-media Sharing, News and Media Portals and Subscriptions and Alerts, targeted to residents, visitors, businesses and employees. Winners will also be spotlighted in a book that addresses current trends and best practices in emerging social media technologies as they relate to improved government services and communications. Pinellas County received a National Digital Government Achievement Award from the Center for Digital Government in the Government-to-citizen County government category for the innovative eTownHall web portal. The Digital Government Achievement Awards (DGAA) highlight outstanding agency and department websites and applications. Forty-three awards in six categories were given this year.